Rrose Sélavy & Miasmah present a second evening at ausland. This time with two live acts from the label. We´re very excited to be able to host the first Berlin appearance of the duo of Gareth Davis & Frances-Marie Uitti, who released the abstract but darkly beautiful album ”Gramercy” on Miasmah in 2012. This will be a one of a chance oppertunity to catch the duo live. Labelhead Erik K Skodvin aka Svarte Greiner opens the evening. 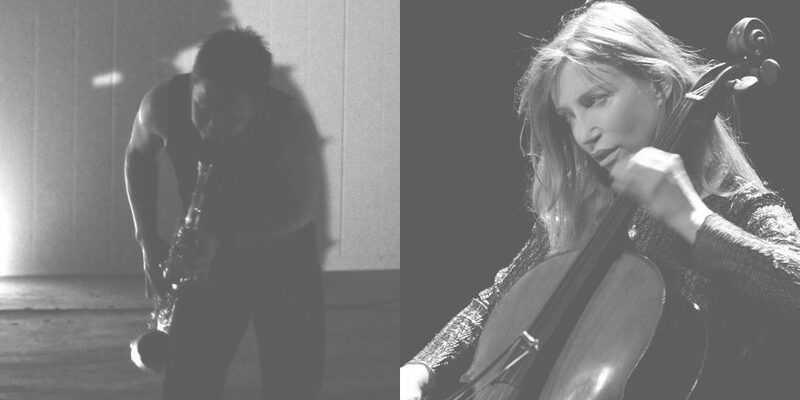 Frances-Marie Uitti (US/NL) is a composer/performer & virtuoso cellist who pioneered the two-bow technique as far back as 1980. She is known as a relentless collaborator and performer, who has worked with legendary composers such as John Cage, Giacinto Scelsi & Iannis Xenakis amongst countless others through the last 40 years. Gareth Davis (US/NL) is an unclassifiable clarinet player, whos name has appeared on a vast span of records within free improvised and experimental music throughout the last decade. As a collaborator has worked with such different artists as Elliot Sharp, Robin Rimbaud, Merzbow and more. Svarte Greiner is the solo guise of Berlin based Norwegian Erik K Skodvin (of Deaf Center & B/B/S). Working mostly with darkly painted soundscapes through bowed guitar, effect-pedals and a varied sound making tools, his music and live performance can be seen as something of a time stopping cinematic experience, embodied by surreal peaks of guitar improvisations, sound effects & low rumbling drones. Working otherwise with soundscapes both for visuals, film and as inspirations for his own record label Miasmah, he attempts to purvey something of a timeless and honest sound merging melancholy with horror.